That was another heartbreaker. It hurts more than the first game because they really shouldn’t have been hanging around without Big Shot and Amar’e. Jeffries didn’t make the best move ever on the final play but what do you expect from him? If anything, my big criticism is why is Roger Mason in the game? He did make a big 3 but Landry Fields was playing OK and isn’t afraid to put the ball on the floor out there. The Knicks played valiantly. 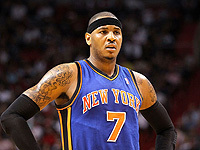 Carmelo was awesome, not only scoring but rebounding, playing D, and getting his teammates involved. Rondo created some problems and the big guys need to help out better although that does leave some of the perimeter guys open. Besides that, the defense has been really good. The guys are shifting and contesting every shot. If the team was healthy, I’d predict a big Game 3 but I’m afraid especially with Amar’e hurt. I liked the way Toney ran the team. It was quick and upbeat but he needs to stay out of foul trouble. Still, you miss Big Shot’s experience. The crowd is going to need to come up huge for Game 3.